Get away from it all without being too far from the essentials! Overlooking the clear waters of Nepean Bay, this attractive, fully self-contained holiday house has a secluded, 7km long sandy beach. Clearwater Haven is situated on 107 acres of gorgeous countryside, including more than 30 acres of natural bushland with large gum trees and abundant native wildlife. Imagine gazing into the sunset from the front deck while kangaroos and wallabies graze and the occasional echidna strolls by. Built in 2011, Clearwater Haven has modern, open plan living and plenty of room for three sets of friends, two small families or a large family. With three bedrooms, Clearwater Haven comfortably sleeps up to 6 adults and two infants in 2 queens, 2 singles and 2 cots. Luxury Sheridan linen, bath towels and beach towels are provided; cot linen available on request. All bedrooms have blackout blinds as well as curtains to ensure a peaceful country sleep. No need to pack the kitchen sink--the kitchen has all the essentials, including welcome coffee, tea and milk, and all the crockery you need to cook up a storm. A full oven, microwave, toaster and washing machine mean you can settle in for a longer stay with the comforts of home. Dishwashing and laundry detergents as well as hand and body soap mean less to remember to pack. Split bathroom (shower & bath, toilet and sink all separate) perfect for families. The house is a short 200 meter walk through native vegetation to the beautiful sandy beach and calm waters of Nepean Bay, perfect for boating, fishing, swimming, kayaking or just strolling along the sands. At low tide, warm shallow pools perfect for small children form. Clearwater Haven is child-friendly, with two cots, a highchair and two types of baby baths. Thoughtful extras like children’s dishes, cutlery, a nightlight and non-slip mat for bathing older children make it that bit easier to travel with children. Books, toys and children's DVDs help keep little ones happy when the rest of the family is relaxing. At Clearwater Haven, you can bushwalk to your heart's content through native grass trees and mature gums. Or maybe after adventuring to Kangaroo Island's famous Remarkable Rocks and Seal Bay, you'd like a quiet day in, spending some time with family or friends while enjoying our selection of board games, movies and books. If you like to fish, you can try your luck with a fishing rod from the beach or launch a small boat. In the evenings, enjoy a glass from one of Kangaroo Island's famous wineries on our large entertainment deck while cooking up the day's catch on our barbecue. This eco-friendly, off-grid home has ample solar power and rainwater. We keep our calendar up to date, so if dates are available on our calendar, feel confident in making a booking request. toilet, tub, shower, Inc towels & soap. The property had everything we need. WE enjoyed our stay and love the fact that it was so seclusive. We love the quietness and serenity. The beach is awesome and we went for long walks. Peter even tried to catch fish. Overall it was a good experience. Comfortable with excellent deck great for meals with small children. A comfortable beach house with an extensive deck which provided a great place for meals and for enjoying some peace and quiet in the evening. An amazing beach stretching for miles , virtually deserted except for us and some dolphins. Perfect for small children. Secluded setting short stroll to a beautiful private beach. House has everything you need and a big deck to relax on and enjoy the birds flying around the native bush land. 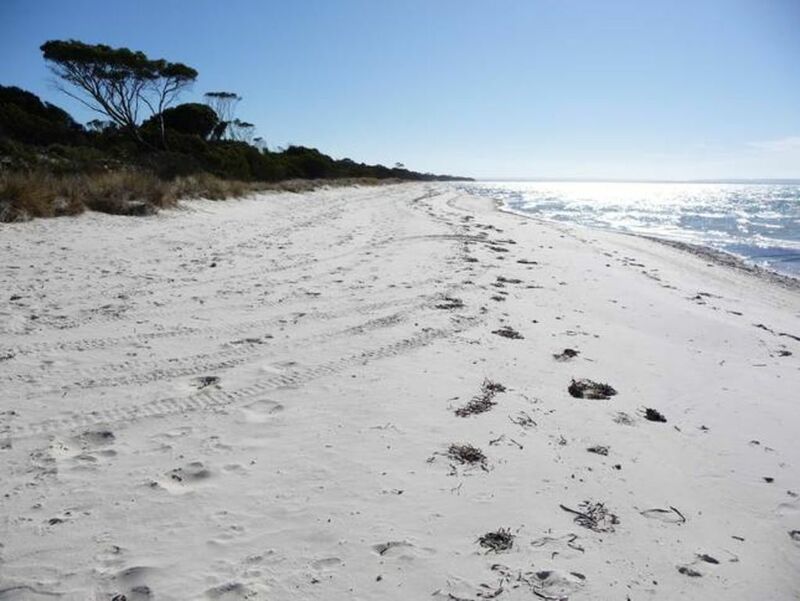 Clearwater Haven offers a private and serene bush setting with amazingly close beach access. Loved the visiting echidnas and birds. House has everything you need except for fans. Last day of our stay was getting warm and the sea breezes weren't enough to cool things down comfortably. Off the grid power meant no toaster and all gas cooking/heating but this was no problem at all. Glad to hear you enjoyed the privacy, beach and wildlife, Bid! I wish we'd known you were warm the last day--we have fans which we bring out for the few days of the year that the sea breezes and cooler summers on the Island aren't enough. Hope you enjoy your memories of Kangaroo Island and we'd be delighted to have you again if you return. Clear water was a fantastic property - and we did not want for anything. We had a great time. Wonderful location, great facilities in a natural setting, saw heaps of wildlife including stingrays, crabs, wallabies, kangaroos, echindnas..the list goes on. highly recommend!!! and the owners were super helpful in response to our forgetfulness. Thanks so much PS I especially loved the colour coded book case - it is exactly how I would have done it!! I'm delighted you and your family had such a good time! The wildlife at Clearwater can really put on a show. Hope to be able to welcome you again.